Sequentix Music Systems – home of the P3 Analogue Sequencer. Cirklon is a totally new hardware sequencer design, with software based on the P3, but greatly improved both in usability and internal operation. The user-interface is based around a 240×64 pixel graphic LED display, 19 rotary encoders with push-switches, 2 assignable knobs, 35 high-quality Cherry keys with integrated LEDs, and a further 35 tri-colour status LEDs. Cirklon has 16 tracks, with 5 independent MIDI INs and OUTs to connect a large number of controllers and synths/sound modules while keeping MIDI latency to a minimum. There will also be USB MIDI, native CV/gate support, and a dedicated DIN sync output. The 32-bit, 72MHz ARM Cortex CPU runs a proprietary sequencer engine to ensure optimum timing accuracy. 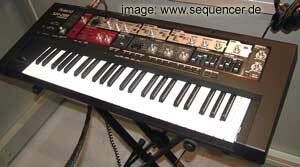 All MIDI ports are provided by hardware serial ports in the CPU core itself. The CV/gate connectivity will be available in two levels – a pair of 12-bit resolution CV and gate outputs, or an external CV breakout box with a large number of CV outs (details to be finalised). Pattern storage is comprised of 2MB battery-backed internal RAM and 512MB internal NAND flash, with a SD/MMC card socket for data backup. Cirklon will go into production just as soon as we have finalised the design of the production enclosure. We hope to start shipping in low volume in March. Price is expected to be under 1000 ukp.